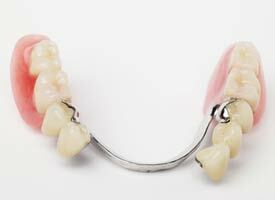 A removable partial denture is designed specifically to replace one or more missing teeth. A natural appearance and speech clarity is restored along with the ability to eat more efficiently. Dr. Swiger will design your partial denture so that the chewing forces are evenly distributed over the entire surface are of the remaining teeth and soft tissues. Changes to your remaining teeth may be recommended to help equalize these forces. Metal partials and Acrylic partials are both options, depending on which teeth need to be replaced. Dr. Swiger will consult with you to determine the appropriate partial for your situation.